Boston CC Firsts hosted Lindum in a mid-table clash in the Lincolnshire ECB Premier League. With both sides still targeting a top-half finish there was a lot on the line as the coin came down in favour of Boston captain Tom Baxter, and he opted to bat first. Ben Troops was soon dismissed by Onyon for four before Jonny Cheer fell to Wright, both being caught behind by the impressive Bishop. Sam Holland and Ishan Jayaratne attempted to re-build before a mix-up in communication saw Holland dismissed with a direct hit from Wright. Tom Poole fell for 0 and Boston were struggling on 53-4. A 60 run partnership from Michael Musson and Jayaratne steadied the innings slightly but the introduction of Rolfs brought the dismissal of in-form Jayaratne for 49 when he found the hands of long-on from a full toss. “Ishan batted really well again,”Baxter said. Boston struggled thereafter and were soon dismissed for 136 from only 36 overs. “We didn’t perform with the bat,” the skipper added. After the tea interval, Boston knew that early wickets were key. Two Jayaratne wickets - claiming the scalps of Morley-Barnes and Taylor - saw Lindum 26-2. Wright and Tomlinson steadied any worries that the Lindum side might have had and pushed the Lincoln side closer to home before Jayaratne found the edge of Tomlinson’s bat and he was dismissed for 37 and left Lindum 87-3. Another partnership was built and Rolfs and Wright took Lindum within four runs of their total before Troops bowled Rolfs and then dismissed Onyon. Lindum got over the line in the 43rd over with a Wright boundary that saw him end the innings 47 not out. “They batted well and knew that they didn’t need to take any risks,” Baxter said. “Player for player, they are a better side. They should finish above us and with that result on Saturday, probably will. 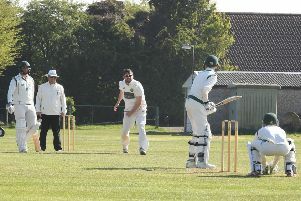 Boston Seconds were beaten by eight runs at Skegness Firsts on Saturday. The away side made 148 but the seasiders respeonded with 149-2 in this South Lincs and Border League Premier Division contest. There was a five-wicket success for Boston Thirds at Uffington in the SLBL Division Two. The hosts ended their innings on 188-7, Boston responding with 189-5. Boston’s Sunday side were beaten at Woodhall Spa in the Lincoln and District League Premier Division. Ben Troops took five wickets for the loss of 20 runs but the hosts posted 187-9. Boston were dismissed for 128, Scott Elleray (42) and Dan Fox (13) top scoring.